the adventures of tartanscot™: "Raising the Roof . . . "
There are several things that should be noted in short order here. Firstly, 'yay!' - it's finally the weekend. Secondly, the I'm-going-to-completely-redesign-my-house project is humming away at full speed. Tons of decisions made this week - very excited. Most recently, I had kind of a tumble this morning (at 7:24am) while at bootcamp and kinda messed up my left shoulder. It was all quite humiliating. I was doing pull-ups. Then, ever so suddenly, I was holding my shoulder - and swearing like a sailor. Big thanks to all of our trainers for taking care of me . . . and for their quick response. Rustic. Modern. and clearly comfortable. 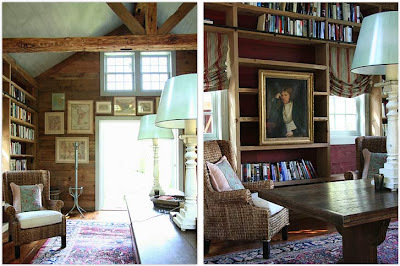 Well, what you might ask does any of this have to do with my little design blog? Well - I promised myself that I would finish blogging before I took my next pain pill - and, well - I would really like to take one right now . . . So . . . before I drift off to blissful, numb slumber . . . something comforting. something warm and welcoming. 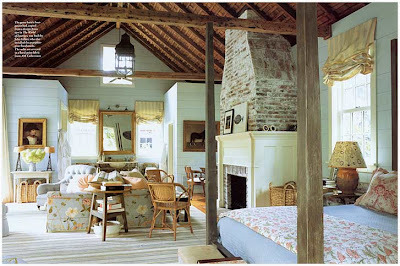 And maybe something with some exposed rafters . . . 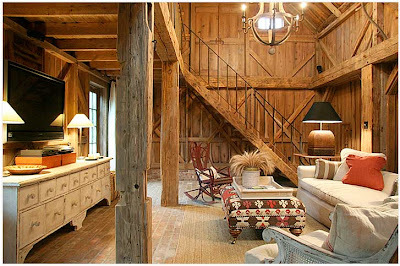 Seriously, HOW fantastic are these barn conversions from the New York design firm Carrier and Company? I love the mass of the space . . . and the perfect colours. Love. Love. Love. The exact place to spend a relaxing weekend. And - speaking of curled up in the bed . . . I'm going to do just that very thing. Tomorrow morning is an early wake-up for a rehearsal for my next chamber concert. 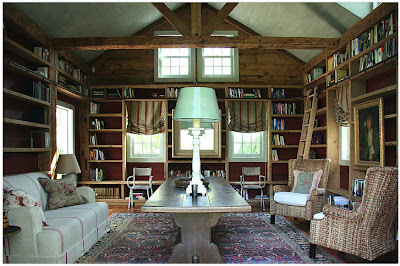 It's a long story, but I lived in a former barn for seven years. While it was an adventure, it was also really hard to keep warm. I always wished it would look something like those pictures. My ex still lives there. Oh well. Take care of that shoulder ~ rest and be good to yourself. @Debra - done and done. I'll see if I can photo-shop up some mug-shot photos . . . lol . . . 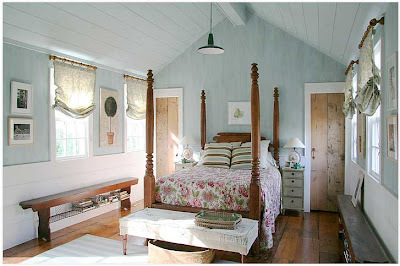 I love the barn makeovers, wonderful details , great images, thanks Scot! a good way to get some rest, but hope your shoulder mends quickly. Great images. Now rest. Really. I hope you are feeling better today. Love Carrier and Co's work. Aren't they fantastic? 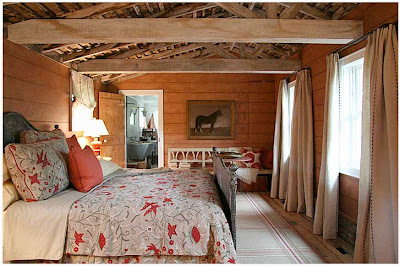 Oh yes, what lovely beds to spend a rainy weekend in! Hoping your shoulder doesn't give you too much trouble. Nice work being at bootcamp so early in the morn! I hope you feel better! Yikes. These images are beautiful and perfect for my farm. We have a barn we intend to create a habitat in some day some way. Straight into the archives these go. ooh, these shots have such a great elegant, gentleman's counry house feel. Poor guy, feel better with that shoulder.